http://www.blogger.com/html?blogID=1755139666841541603 about a dream: A tea party! They had the cutest tea party at the Opera House today. Look! Me and the girls. Aww! Nina with her doll Marisol. The whole group. Isn't that a lovely table? Decorated with an Easter theme! See that dress Marisol is wearing? Nina designed it and I made it. Yesterday! 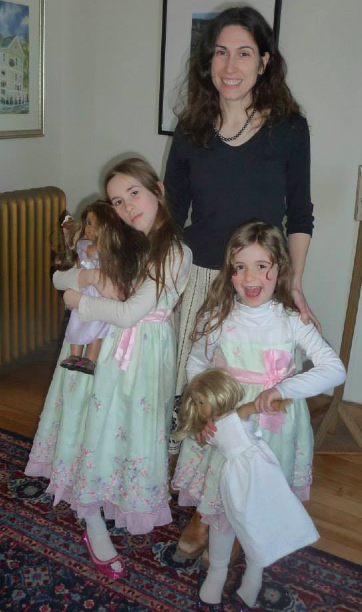 Because no matter how much I have to do, none of it is as fun as making doll dresses with the girls! Kit got a new dress too, of course! Maggie designed that dress all by herself. We had so much fun!! All of you girls (and dolls!) are so sweet!!! ... and the dresses are beautiful, too! Maggie Mouse in Peter Rabbit! !